The last dirt samples have been added to “Dirt Stage” today on the last day of the Water and Land Art Triennial in Niigata. After adding the last twelve samples to the grid, a symposium was held to discuss the meaning of this work and its process. It was an incredibly meaningful yet emotional day as we faced the last day of the three-month exhibition in Niigata. Many questions about the work emerged in the symposium together with guest Meruro Washida and artists James Jack, Yoshitaka Nanjo and Shotaro Yoshino at Base Camp. 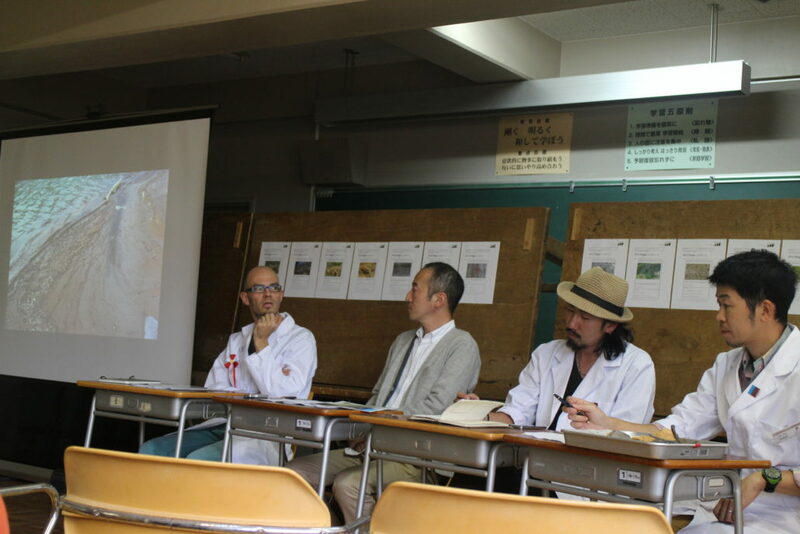 The symposium titled “Living Dirt: Memory and Rebirth in This Place” was focused on questions that have arisen based on the activities of World Dirt Association. Core issues arose on the topic of the balance between collecting, moving and exhibiting dirt as well as the balance between earth and information. Specifically the focus of this discussion was on the background for this work, the collaboration which ensued as well as the methods for reconsidering our relationship to dirt. The problems of working with living materials was addressed while thinking about the distinctions between interior and exterior spaces. Together with numerous volunteers in all stages of this project, we found new layers of dirt which lies beneath us. The life of dirt as a medium for other microorganisms, insects and plants was reflected on in the context of art as something that needs to be protected from ageing. This work deals directly with time, specifically mapping the passage of time with the addition of dirt samples into the grid. In a symmetrical structure the spontaneity of dirt samples sent from 115 sites over the past three months has brought together this artwork.